With the hot topic about “breaking” NDAs or embargoes being in the gaming circles at the moment, the one thing that a lot of people probably didn't expect was that breaking an NDA regarding top secret next-gen gaming technology and spilling all the beans would get you raided by police. Well, actually I think a lot of people probably did expect that. GameChup caught wind of SuperDAE, a chap who had the privilege and opportunity to work on Microsoft's next generation gaming console and who was responsible for letting us know that the console would be an octo-core system with 8GB of RAM and a 50GB capacity Blu-ray drive. We can pretty much take it for fact now that those are the specs. However, GameChup's screen capture of the tweets from SuperDAE reveals that the police had a warrant to nab his stuff. Here's a screencap of his twitter before it goes anywhere. You can also read it directly via the link here. Well that sounds like it was about as fun as playing spank-tag with a sock full of rocks, eh? Anyway, that's one of the dangers when you sign an NDA or a non-disclosure agreement...the police can come-a-knockin' and go all 1984 on your buttocks, all because you signed away your rights to speak freely of a matter. That's how legally binding contracts work. Some speculate that SuperDAE tried to sell stuff on eBay and that's what triggered the police response. 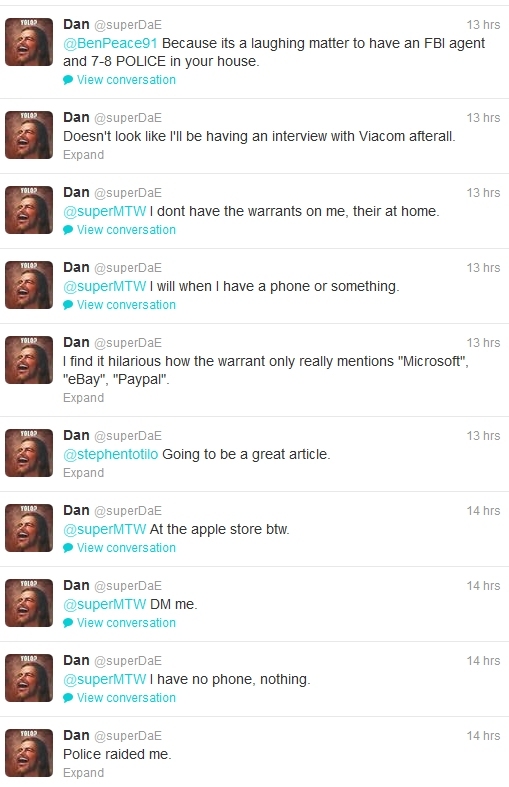 Funnily enough, SuperDAE Dan made the twitter comments about his place being raided from an Apple store, to let people know what was going on, since they took his phone. It's a pretty safe bet to say that breaking this kind of NDA was just not a very smart thing to do and I can't say it did the gaming world a whole lot of favors, but it did help drive hits to a few big sites that got the first dig at the leaked specs.